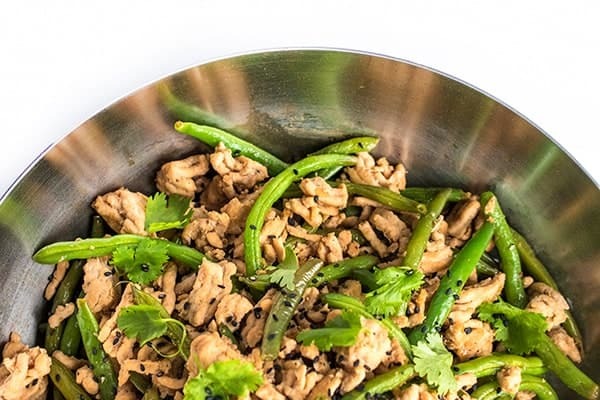 A quick and easy gluten free and healthy Asian stir-fry recipe with green beans, ground turkey, ginger and hoisin. On the table in 30 minutes or less. Green bean season is right around the corner and I am pretty thrilled! 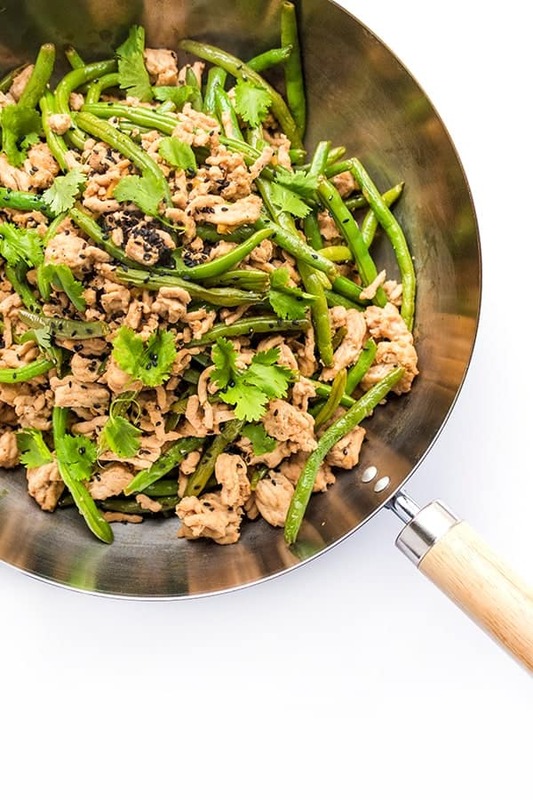 Of course, they are great on their own, stewed with tomatoes or roasted with bacon, but today I’ve decided to add them to a quick and easy 20-minute stir-fry recipe with ground turkey. Ground turkey probably isn’t the first type of meat you think of when making a stir-fry but I’d like to suggest you give it a try. Spicy chili-garlic paste is combined with sweet hoisin, fresh ginger and plenty of garlic to create a delicious and healthy dinner unlike any other. Of course, if you don’t have ground turkey you can easily swap in chicken, shrimp or tofu. No green beans? Try broccoli, peas, cauliflower or zucchini. Let your farm stand be your guide. The best part? It makes fabulous leftovers and actually tastes even better the next day! Serve with brown rice and dinner is done in under 20 minutes. Pre-heat a large wok or deep pan over high heat and spray with non-stick spray. Add ground turkey, garlic and ginger. In a small bowl, whisk together chicken broth, corn starch, soy, hoisin, rice vinegar and chili garlic paste; set aside. Once turkey is browned and bits and pieces are sticking to the pan, add in green beans and broth/soy mixture. Saute 3-4 minutes then add water chestnuts and sesame oil. Cook an additional minute or two then serve. Great with brown rice. See more of my Asian recipes on my Pinterest board! Yay green beans! And I’ve got tofu in the fridge that’s going to be so tasty in this recipe. Thanks! Thank you for letting me know! Just fixed it! Found this in a Pinterest search but I’ve used lots of your recipes. I love the FLAVOR you put into food. This recipe was a big win with both kids – that is no easy feat. It was so delicious! It will definitely be making a repeat appearance on our table. Yum! WOW-ran across your green beans and ground turkey recipe by mistake. We started the Unhealthy Anonymous program were looking for some good alternate recipes and WOW. We loved it. I only had a 1/2 up of green beans so I added in a cup of spinach and it was delicious. Oh I’m so glad you like it!! Made this tonight and it was very tasty…did not put the chestnuts in. What a fantastic recipe! My husband halved the amount of chili garlic sauce, and my 3 year old daughter ate her entire plate. If it were just hubby and me, we would definitely use the whole amount of chili garlic sauce called for. Will make again!! Making this tomorrow night for dinner. What size is an actual serving? I count my calories and have to be careful! Sorry about that – just updated the post to include the serving size which is 1 cup cooked stir fry. Enjoy! Thank you! It looks so delicious, I can’t wait to try it tonight! No need to cook them first! Just trim off the stem. :) Enjoy! haha!! That’s a good problem!!! I wish my toddler could handle spicier foods. Awesome! I didn’t have hoisin sauce and it was still outstanding! One of the best recipes I’ve come across. Thank you! I just tried this – very good, and dead simple. I was afraid it would be too bland, because I like bold dishes, but this one had plenty of flavor. I substituted a bag of frozen, mixed veggies for the green beans, omitted the water chestnuts (didn’t have any) and used regular vinegar. Thanks for the recipe!! I’m so thrilled to hear it Ken! I made this tonight, with fresh hoisin and chili paste and OMGoodness, it is sooooooo yummy! I don’t have sesame oil, so used canola instead. I haven’t done it as directed, so I can’t comment on the difference. That sounds so delicious!! So glad you enjoyed it! Try the sesame oil next time – it really takes it to the next level. This is one of our family favorites. It’s not too spicy for my 5 year old either. Oh I’m so glad to hear that Natalie!! And funny enough, it’s on our meal plan this week as well. :) Let me know if you try any other recipes!! Made this last night with ground pork we had in the freezer. Delicious and easy, too! Not too spicy for my 5 year old either. Kids did ask me to make the green beans softer next time. Will probably steam them for a couple of minutes before adding to the wok. I just made this and it is delicious! I happened to have some well cooked cauliflower and I heated that up and mashed it up and pretended it was rice and wow was it good! No carb dinner! Found on Pinterest, looking for something to do with ground turkey, I made this tonight. I was super impressed by how quickly it came together (LOVED the tip about the potato masher with the turkey, that was awesome! ), and then even more impressed at how yummy and fresh it was. It will definitely be a staple in my repertoire! Thanks, I’m excited to try your other recipes! This was delicious! My husband and I loved the flavors. Well done! Look delicious. Can Sriracha be used instead of “chili garlic paste”? Where do you find chili garlic paste (brand?)?. Thanks for such a quick, easy and healthy recipe, I cannot wait to try it! Hi Julie! I just added a link to the chili garlic paste so that you can now find it right on Amazon! Otherwise, you can find it in most major grocery stores or Asian markets. If you can’t get your hands on it, I would skip it and just add sriracha before serving (or serve it with sriracha on the table.) Hope that helps! Enjoy!! Made this a couple weeks ago. So yummy!! Thank you!! Very very good, will be making this again that’s for sure. Sooooooo yummy and pretty easy to throw together! I love spicy Szechuan food – I used to make a dish like this but haven’t in a while – going to have to put this on the menu next week! We have it every couple of weeks – such a tasty way to perk up ground turkey!! Made this tonight. I like it. Didn’t have the chestnuts, but don’t think it made a diff. I added a tiny but of sugar. Will make again for sure. Delicious! Hubby and I are doing our best to eat healthier. This one got a “that was delicious – we could eat like that all the time!” Recipe is a must try! Cooked this tonight – absolutely delicious! Thanks for the recipe!! We make this all the time and as you can probably understand as a food blogger, I don’t make a lot of the same meals over and over. Let me know what you think!! Feel free to dial up the spice if your family can handle. :) Enjoy!!! I made this last night!! We loved it!! I will give you a shout out when I post it on my site! :) Thanks for sharing a great meal! How was it?? Did you ever post it on your site?? This looks delicious! Love that the leftovers are good also! Highly suggest making extras for just that! !